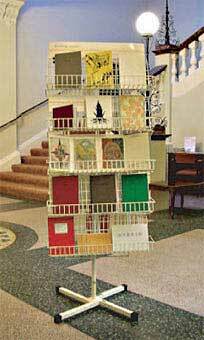 The aim of Floating World is to find ways for artists to disseminate their ideas as widely as possible using the medium of artists books. Glenn Holman and Andy Parsons initiated the project in 2003, and have asked more Artists to contribute and collaborate over the years. Recently, Floating World has used the Artist Book as a catalyst for complex participatory projects, ranging form the renovation of a derelict house into an Arts Centre to the creation of a book of insights into Samuel Beckett. Floating Worlds books have been seen in a variety of contexts, from a disused Pharmacy in Sligo – to Tate Modern. Holman and Parsons are developing more projects in this vein over the next few years. Initially the artists invited to contribute a book were chosen to reflect the wide variety of contemporary practice from Sarah Carne whose work is performative and video based to Edwin Aitken who works primarily in painting. For all the artists involved, creating a book became an absorbing and challenging research project. On a practical level this project involved the sharing of expertise with other artists unused to both the more traditional bookbinding and printmaking processes and with some of the difficulties entailed in producing work digitally. Each of the books made for Floating World is a discrete and autonomous piece of work, which although linked to each artists ongoing area of investigation is nonetheless an artwork in its own right. Each of the pieces are rich and personal works that unfold in the viewers mind in the same way as a piece of literature creates a world into which the reader can step. Andy Parsons is now based in Ireland while Glenn Holman lives and works in the UK. The geographical separation allows for development of a genuinely international outlook. 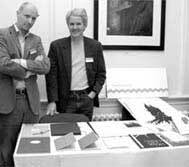 Increasingly dissatisfied by the established means of exhibition artists books, Holman & Parsons have moved to present Floating Worlds work in a gallery based context and to encourage critical discourse around the medium. Much of our recent work has been specifically focused on democratising the production and consumption of contemporary art. Floating Worlds first exhibition Reading Room at Sligo Art Gallery, set the template for much of their future work and aimed to be “be a new kind of exhibition – one where you can pick up the art works and look at them”, The three room exhibition comprised a ‘reading room’, with shelves built around the walls and sofas and a table, were visitors could walk in off the street into the gallery and take artists books off the shelves to look at them.The fact that you could handle the works made it a very unconventional sort of show. It was designed to put the democratic impulse that underpins the whole philosophy of Floating World centre stage.The second room comprised objects/artefacts which link to the books each artist had included painting, prints, photography, sculpture and video, reversed the conventional hierarchy of art production by setting out traditional art objects such as paintings prints sculptures as an index to the books. The third and final room in the gallery was a making room containing detail explanation of techniques where visitors could make their own artists books using materials provid. 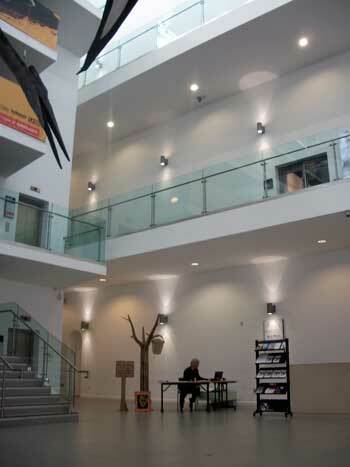 Other recent projects have included the ‘Book House’ in Cavan, which was a temporary publishing house for the public to make their own books and Floating World’s show at Enniskillen Castle Museum, which combined artists book works made by the public, with objects from the Museums social history collection. In 2012 Holman and Parsons were commissioned as part of ‘Happy Days’ the first International Samuel Beckett Festival in Enniskillen, to create the artists book Beckett Bucket. It was based on four days of interaction with members of the public seeking their insights, anecdotes and knowledge about Samuel Beckett and then transcribing these as text and drawing in real time, creating an artists book as a performance. Beckett Bucket is now in many important public collections and was selected for the International Artist Book Prize in Sheffield in 2013 and ‘RUKssian’ and international exhibition of artists books held in Moscow in 2014.